It's that time of the year again! Rain drops, fresh air, and cold breeze - There is nothing like driving in the rain! But driving during the monsoon season comes with responsibilities and you need to take several precautions while riding in the rain! 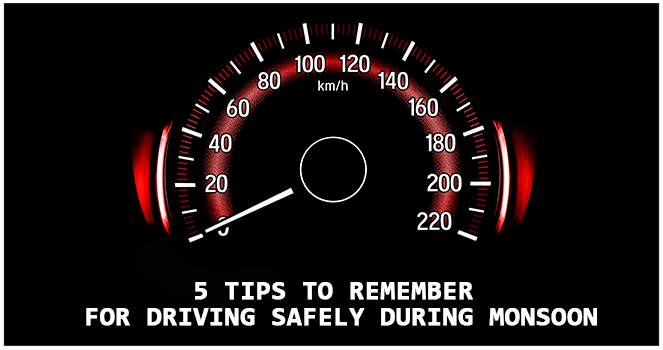 Follow these tips to help you stay safe while driving in the rain! In rainy season, it's important to drive smooth and keep better car control. Don't accelerate or brake suddenly. You should make conscious effort to brake early and calculate turns in advance. As the roads are slippery, sudden brakes or turns can to lead accidents. Over speeding is a big "NO" for any seasons but during rainy season, chances of tyres skidding are much more. Better to be careful than sorry! It's important to check your car tyres and overall health before going on a road trip. If you are ready for your next monsoon road trip, you can check out self-drive car rental options from Volercars. We ensure your safety and comfort. Our cars are cleaned and serviced prior the trip and we have various pickup points around the city, but you can still choose to get the car delivered at your doorstep. Opt for freedom and flexibility to drive a car of your choice. Rain always adds an extra dose of excitement to your road trip! But make sure you avoid overtaking especially during this season even if you are stuck behind a slow moving vehicle. It is better to drive a bit slow. Driving fast and overtaking may lead to accident as other drivers might get confused due to sudden burst of horns and flashlight. Also, chances of skidding are very high when you over take or over speed your car. Drunk driving always calls for mishaps! After drinking, think before putting those keys in the ignition & driving away - You are putting your life in danger. Also, you are risking those lives that come across while driving. Allow life to thrive, be wise - Don't drink and drive!